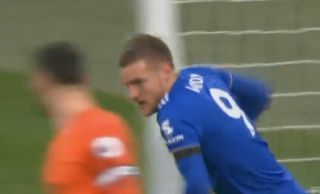 Jamie Vardy finished off a superb flowing team move by Leicester City to make it just 2-1 to Tottenham in today’s Premier League clash at Wembley. The former England international pounced from close range inside the box to halve the deficit for the visitors, giving the Foxes a late lifeline against Spurs. This followed a spell of quality possession and passing from Leicester, who completely opened their opponents up with this fine move.